Israeli policemen arrested Wednesday a Palestinian young man after stopping his car at a military checkpoint near Qalqilia. A police statement claimed that a Palestinian car rammed into a checkpoint near a Jewish settlement illegally built south east of Qalqilia. The driver was arrested while his companion managed to flee the scene, the police statement added, without reporting any injuries. An investigation has been opened in the incident, according to the statement. Despite living under a brutal military occupation, Palestinian towns and villages located near illegal Israeli settlements are subjected to regular attacks by both Israeli forces and settlers. Palestinian detainee al-Montasser Billah Mahmoud Eid, from Burin village, in Nablus, has gone on an open-ended hunger strike in protest at being held administratively, without charge or trial, in Israeli jails. 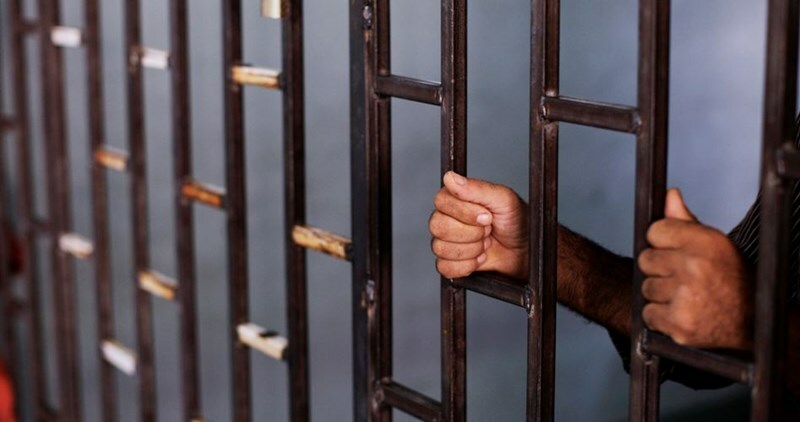 Director of the Palestinian Prisoners Society (PPS) in Nablus, Raed Amer, said the detainee initiated his hunger strike on May 18. Amer added that Eid was transferred by the Israeli prison service to a solitary lock-down in the Negev jail. Prisoner Eid has been held in administrative detention since October 20, 2015. His six-month prison-term was renewed last month by the Israeli occupation authorities. Female Palestinian detainee Aalaa Saed Assaf has been locked up in an isolated cell in the Israeli Maskoubiya jail for 16 days, the Palestinian Prisoners Society (PPS) said Wednesday. 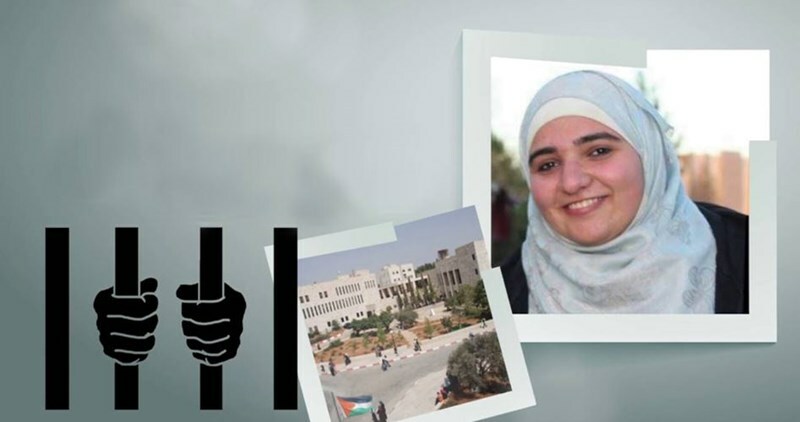 PPS lawyer quoted prisoner Assaf as saying that she was kidnapped by the Israeli occupation soldiers from her own family home in Birzeit on May 9. She added that the occupation soldiers dragged her to an Israeli military camp handcuffed and blindfolded before they transferred her to the Maskoubiya lock-up, where they shackled her with plastic chains, causing her severe pains. The detainee also said the abduction prevented her from attending her graduation ceremony at Birzeit University. Israeli soldiers invaded, Wednesday, the al-‘Eesawiyya and Abu Dis towns, in occupied Jerusalem, and kidnapped four Palestinians. The soldiers searched homes in the al-‘Eesawiyya town, in the center of Jerusalem, and kidnapped two young man, identified as Mohammad Ashraf Abu al-Hummus and Mansour Nasser. The army also invaded Abu Dis town, northeast of Jerusalem, and kidnapped a physician identified as Daoud Ayyad, after confiscating his laptop, and a young man, identified as Shadi Mheisin. In related news, the soldiers kidnapped, on Tuesday evening, a young man, from Qabatia town, south of the northern West Bank city of Jenin, while working in Jerusalem. He has been identified as Ala’ Mohammad Abu ar-Rob, 21. On Wednesday at dawn, the soldiers kidnapped thirteen Palestinians in the West Bank; eleven in Salfit, and two others in Hebron and Ramallah, while five others were earlier kidnapped in Bethlehem and Nablus. 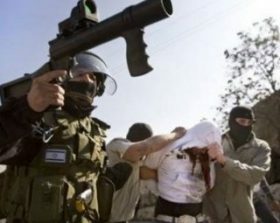 Israeli soldiers kidnapped, on Wednesday dawn, nine Palestinians in the central West Bank district of Salfit, and two others in Hebron and Ramallah. Five Palestinians were also kidnapped earlier in Bethlehem and Nablus. The Palestinian Prisoners Society (PPS) has reported that several Israeli military vehicles invaded Kafr ed-Deek town, west of Salfit, searched and ransacked dozens of homes and kidnapped nine Palestinians. The kidnapped have been identified as journalism student of the Najah National University Ezzat Saleh Shunnar, Nabil Mohammad Abi Aziza, Hasan Farahat, Ahmad Rashid, ‘Ameed Ahmad Abdul-Karim, Mohammad Ibrahim Mousiyya, Yousef Mosleh ad-Deek, Dia’ Jasser Aqel, and Yousef Abdul-Wahab. Furthermore, the soldiers invaded and searched homes in the southern West Bank city of Hebron, and kidnapped one Palestinian, identified as Naim Rajabi. Army vehicles also invaded Yatta town, south of Hebron. Another Palestinian, identified as Mohammad al-‘Adasy, was kidnapped from his home in Silwad town, northeast of Ramallah. Also on Wednesday at dawn, the soldiers kidnapped five Palestinians; three, including two children, in the West Bank district of Bethlehem, and two university students in Nablus. In addition, the soldiers invaded the towns of Harmala, Janata and Teqoua’, near Bethlehem, and searched many homes. Israeli soldiers kidnapped, on Wednesday at dawn, three Palestinians, including two children, in the West Bank district of Bethlehem, in addition to two university students in Nablus. The soldiers invaded Teqoua’ town, east of Bethlehem, searched homes and kidnapped Mohannad Rateb al-Badan, 21, and summoned his brother ‘Aahed for interrogation. The army also invaded and searched several homes and shops, and sabotaged surveillance systems. In addition, several military vehicles invaded Beit Fajjar town, south of Bethlehem, searched many homes, especially in Sahlet Eid area, and kidnapped a child, identified as Abdul-Qader Sultan Taqatqa, 14, and Essam Mohammad Taqatqa, 14. Furthermore, dozens of soldiers invaded Askar and Balata refugee camps, in the northern West Bank district of Nablus, searched and ransacked many homes and kidnapped two students of the Najah National University. The have been identified as Hamza Ma’moun Ja’ara, 22, and Abdul-Rahman Sabti Dweikat, 21. Dweikat is the brother of detainee Tawfiq Dweikat. 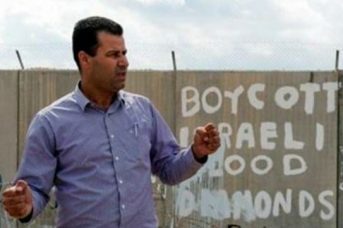 The Ofer Israeli military ordered, on Monday at night, the release of internationally recognized human rights defender, and the coordinator of the Popular Committee against the Wall and Settlements in Bil’in village, Abdullah Abu Rahma, after he was held for eleven days. He was released on Monday at night, and will have to go back to court in June. Abu Rahma was sent to court several times since his abduction, while the Israeli military prosecutors demanded his continued detention, using various methods, including attempting to abuse his previous suspended sentence, as he was repeatedly abducted and detained in recent years. But his abduction, on May 13, 2016, was documented by many reporters, as he and dozens of Palestinians and international peace activists participated in the “al-Awda” (The Return) cycling competition. The videos proved that Abu Rahma did not assault any soldier, and also showed many soldiers using excessive force against him. The court released Abu Rahma, at night Monday, and ordered him to appear in court on June 1st, and to pay a 15.000 Shekels bail. Following his release, Abu Rahma said he has the right to Freedom of Speech, and to take part in the legitimate nonviolent resistance, guaranteed by International Law, and added that Israel’s conducts violate this law, and the Fourth Geneva Convention. Abu Rahma added that the Palestinians, and their supporters, will continue their nonviolent resistance, and that the Israeli assaults, intimidation and violations, will not deter them from continuing the legitimate struggle until achieving all internationally guaranteed rights. Israeli soldiers kidnapped, earlier on Tuesday, two Palestinians in the southern West Bank city of Hebron, while a number of fanatic Israeli colonizers stole furniture of two Palestinian homes that were closed under direct military orders. The WAFA News Agency has reported that several army vehicles invaded the al-‘Arroub refugee camp, near Hebron, before breaking into and searching many homes, and kidnapped two Palestinians, identified as Bayan Khaled al-Badawi, 27, and ‘Ali Jaber at-Teety, 21. 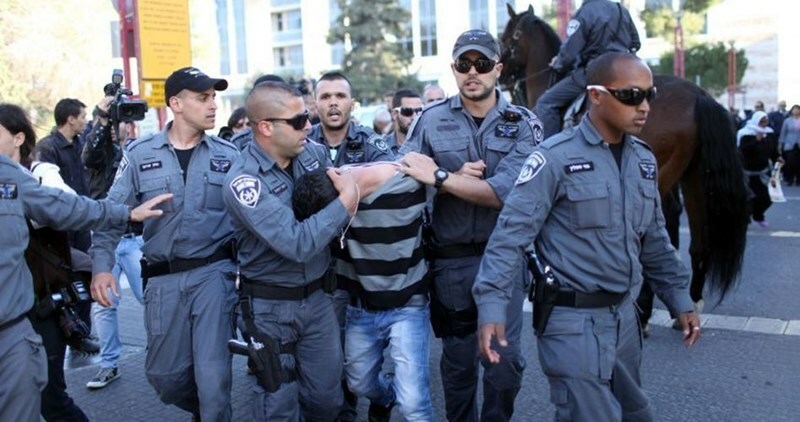 The soldiers also summoned Mohammad Issa Jawabra, 20, for interrogation in the Etzion military and security base. On Monday evening, a number of fanatic Israeli colonizers invaded an alley, linking between the Shuhada and Shallala streets, in Hebron city, breaking into two homes, that were forced shut under military orders. The assailants destroyed furniture in the two homes, and stole furniture from them, before leaving the area. The two homes are owned by two families, Sayyed Ahmad and Tahboob, and were closed under direct Israeli military orders, and the families are not allowed even to enter them briefly. The Israeli Occupation Forces (IOF) arrested overnight 13 Palestinians during predawn raid and search campaigns across the West Bank. 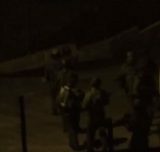 According to the PIC reporter, Israeli forces violently stormed Aroub refugee camp, north of al-Khalil, and carried out raids and arrests. IOF soldiers in more than 30 military vehicles stormed the camp and brutally stormed a local home after blowing up its gate. Three youths were detained during the raid, one of them was shortly released after being severely beaten, eyewitnesses told the PIC reporter. A fourth young man was summoned for investigation, the sources added. Following the raid, violent clashes erupted between local youths and Israeli forces. Meanwhile, IOF soldiers stormed Jalazoun refugee camp and arrested six locals. A young man was also arrested after Israeli soldiers broke into Aida refugee camp in Bethlehem. Similar raid and search campaigns were carried out in different towns and refugee camps in Ramallah, Bethlehem, and occupied Jerusalem. 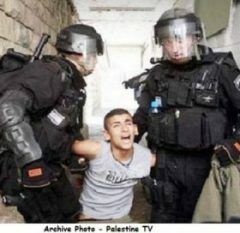 Israeli soldiers kidnapped, on Tuesday at dawn, eleven Palestinians, including children, after invading their homes and searching them, in several parts of the occupied West Bank. The Palestinian Prisoners Society (PPS) has reported that the soldiers kidnapped five Palestinians, in the al-Jalazoun refugee camp, in the central West Bank district of Ramallah. The kidnapped Palestinians have been identified as Jihad Misbah Batanji, 18, Mohammad Wajdi Safi, 16, Aseed Morad Nakhla, 16, Mojahed Salah ‘Oleyyan, 16, and Jihad Nidal ‘Oleyyan, 16. The soldiers also kidnaped a young Palestinian woman in Turmus Ayya town, near Ramallah. She remained unidentified until the time of this report. 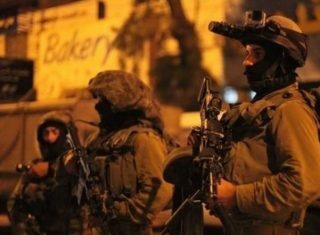 In Hebron, in the southern part of the West Bank, the soldiers stormed and searched many homes and kidnapped four Palestinians, identified as Ali Jaber at-Teety, 22, Abdul-Karim at-Teety, Bayan Khaled Badawi, 27, and Malek Ibrahim Hmeidat, 23. In Bethlehem, the soldiers invaded the ‘Aida refugee camp, and kidnapped Khalil Mustafa Kanaan, 17 years of age. The Israeli army conducts daily invasions and abductions in different parts of the occupied West Bank. 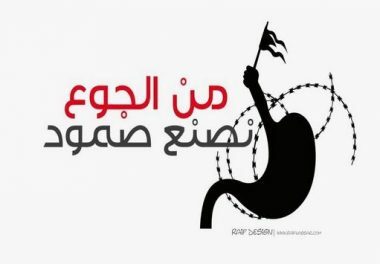 The Palestinian Detainees Committee has reported that the health conditions of detainees Fuad ‘Aassi and Adeeb Mafarja, in Barzelai hospital, continues to deteriorate following 51 consecutive days of hunger strike protesting their illegal Administrative Detention. In a press release Tuesday, the Committee said that the Prison Authority was placing obstacles obstructing their lawyers from visiting with them. It demanded the International Red Cross to increase its visits to the detainees, who started their strike on April 3rd. It said that the two detainees suffered a dangerous weight loss, and have constant pain in various parts of their bodies, in addition to being unable to move. They are also refusing to take any vitamins. Despite their bad health conditions, the detainees are shackled and cuffed to their hospital beds, and are under constant guard. The committee held the Prison Authority, and the occupation, responsible for the lives of all striking detainees, as Israel continues to use of the illegal Administrative Detention policy, holding captive hundreds of detainees without charges. Israeli soldiers have kidnapped, overnight and at dawn Monday, at least nine Palestinians from their homes, in different parts of the occupied West Bank. The army claims uncovering a workshop for manufacturing weapons near Hebron. The soldiers kidnapped one Palestinian in ‘Aroura own, north of the central West Bank city of Ramallah, a young man in Deir Abu Mashal village, northwest of Ramallah, and another Palestinian in Jaba’ town, south of Ramallah. In addition, the soldiers to two Palestinians from their homes, in Biddo town, north of Jerusalem. 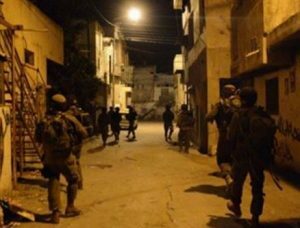 The Palestinian Prisoners Society (PPS) has reported that the soldiers also searched homes in Bethlehem, and kidnaped one Palestinian. It added that the soldiers kidnapped two others Palestinians from their homes in Karma town, southwest of Hebron and in Bani Neim, east of the city. The Israeli army said it located a workshop for manufacturing weapons in Surif town, north of Hebron, and confiscated a lathe machine and a rifle; no arrests were made. The Al-Mezan Center for Human Rights has reported, Sunday, that the Israeli navy has carried out at least 17 attacks against Gaza fishers, since the beginning of this year, and kidnapped 65 fishers. Al-Mezan said that the navy has escalated its violations against the fishers in the coastal region, despite Israel’s claims of allowing them to fish within 9 nautical miles in the central and southern areas of the Gaza Strip, starting on April 3rd. The attacks range between the use of live fire, the abduction of fishers, and the confiscation of boats and fishing tools. Israel is also still banning the entry of fiberglass and other materials that are essential for building and maintaining boats, due to its illegal siege on Gaza since 2007. 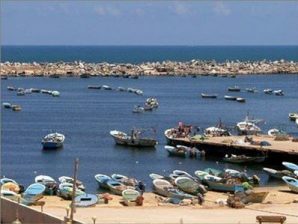 Al-Mezan strongly denounced the ongoing Israeli violations against the fishers in Gaza territorial waters, and its illegal policies of collective punishment against dozens of thousands of fishers, and their families, denying them from their only source of livelihood. It said that the vast majority of fisher families in Gaza are below the poverty line in the Gaza Strip due to Israel’s siege, and its ongoing attacks against the fishers and their boats. The Center also said that the way Israel deals with the fishers is nothing short of attempting to terrorize them, especially by subjecting them to degrading and harsh treatment after abducting them, and confiscating their boats, and the threats against them. In addition, al-Mezan said that, in most cases, the fishers are released just hours after their arrest, as the Navy has no legal course to abduct them, therefore, cannot send them to court, even though the courts themselves are part of this illegal occupation. It renewed its call to the International Community to perform its moral and legal duties, and effectively act on ending the illegal Israeli siege on Gaza, as it constitutes an ongoing war crime. Israeli soldiers kidnapped, Monday, two Palestinians from their homes in the town of al-‘Eesawiyya, in the center of occupied Jerusalem. Local sources said the soldiers stormed and searched a number of homes, and kidnapped Mohammad Abu al-Hummus and Adam Mahmoud. The soldiers interrogated the two Palestinians, and their families, prior to abducting them, and took them to an interrogation center in Jerusalem. Israeli forces on Sunday arrested the old man Ali Abu Esbaitan, one of the Jerusalemite sit-inners at the Aqsa Mosque, after storming his home east of Occupied Jerusalem. Jerusalemite media sources revealed that Israeli intelligence forces broke into and searched Abu Esbaitan’s home in al-Tour district east of Occupied Jerusalem and arrested him to be questioned despite being in his sixties. Israeli forces have been conducting campaigns against the Jerusalemite sit-inners at the Aqsa Mosque since the beginning of 2016. Some of them were charged with belonging to an outlawed organization while others were ordered to remain away of the Aqsa Mosque for various periods.